for all the girls who are dreaming, for all the girls who have had a wedding day, for all the girls in the world. Here I am, you’ve waited for me all your life. You’re wearing white. You’re smile is bright. You say that I am yours. That since you are the bride, things should be done a certain way and everything must be perfect. You’re expectations are through the roof, and I know that I won’t be able to meet them all. Something will go wrong, and I will only last so long. I will wear you out. However, you will look back on me fondly. You will wish you had done something better, or made it less about yourself. But, here I am….you’ve waited for me all your life. I am not important. I am not even magical. Everything about me could go terribly wrong, but as long as you end up married, I will be successful. I am just a moment that is made to be a memory. I don’t have to be perfect. In fact, I won’t be. Let me just be. Remember that I am not the point of life. Every day afterwards makes up something more precious and more valuable than me. The love that will grow in the days to come will be far more than this seemingly significant time. In the end, I will be a blur. I was never meant to be the main event. So, please don’t make me out to be the most important thing. I will fail miserably if your goal for me is to be perfect. I am the beginning of a journey that I won’t even see. But you will. Treasure that. Remember me, but don’t dwell on me. Anticipate me, but don’t need me. Enjoy me, but don’t worry if I’m not everything you hoped I would be. Use me to point others to Christ. Use me to show the glory of His majesty. Use me as a way to reflect on God’s goodness. Use me for God. Use me for His glory. Because in the end, I’m just a day. I’ll stand alone. I’ll be a blur. I’ll not be everything you hoped for. I won’t be magical. I will only last 24 hours, and you won’t even be awake for some of that time. I’ll come. I’ll go. You will only see me again in pictures. So enjoy me, but don’t worship me. If I never come, or I am postponed, if you never see me, and you weren’t meant to live me….remember that I am just a day. The goal of me is to bring glory to Christ. The goal in my being is so that others may see His majesty, and His goodness. And quite frankly, you can bring glory to Christ in every other day that you live. You don’t need a wedding day to do that. Don’t dream of me. Don’t live to see me. Don’t set all your hopes on me. In the end, I am just a day. I’m not even magical. Remember why you have days. Remember Who gave you days. Remember where significance truly is, and it’s not in me. So if you never see me, why that’s OK. Because, I am not your day, but there are a lot of days that are yours, and the purpose of us is not for you. Remember your purpose. All I ask is that you read this letter, and remember all that I have said. I’ll be the beginning for some of you. For others of you, I’ll never be. And for all of you, set your hope in Christ. Don’t set your hope and all your longings in me. Beautiful!!!!! And oh so very true. I really love this. 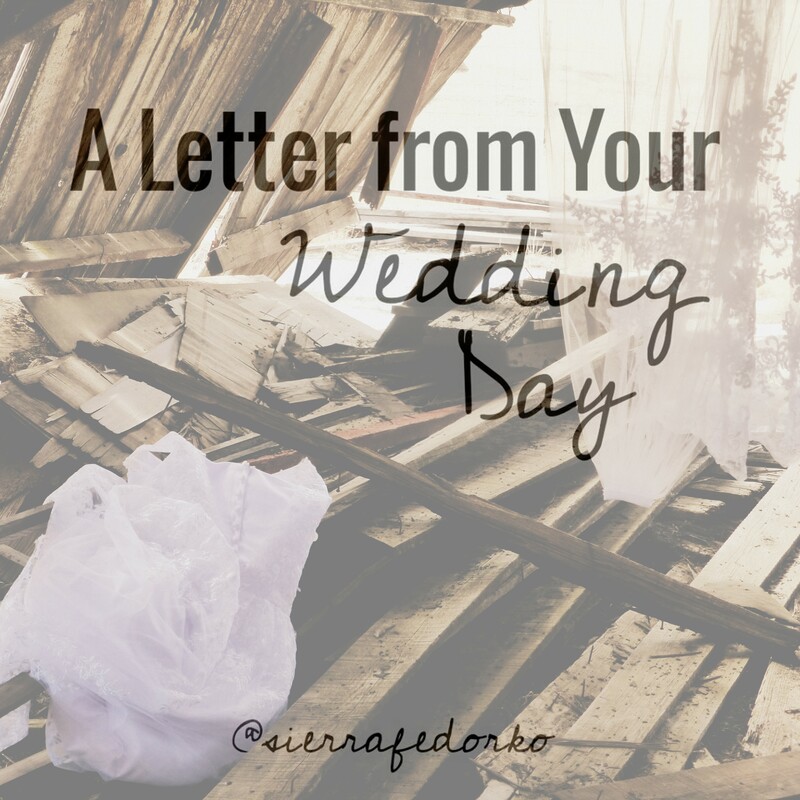 I look back on my single days and just sort of shake my head at my wedding day obsession. Because it really is just one day. And there have been so many other, so many more important days. Love it Sierra! So true, if you ask me, I only remember pain.. haha.